Most regions in Italy have their favorite sweet bread, pies, and cookies that are served at Easter time. Dolci (dessert) is an important part of the Easter feast. Chocolate eggs are, of course, among the favorite. 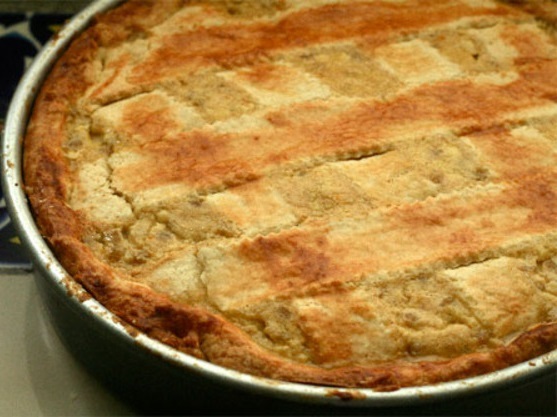 The Pastiera Napoletana is another authentic Easter tradition; originating in Naples, this cake is made with cooked wheat, ricotta cheese, candied fruit and orange-blossom water. The Pizza Pasqualina, a dessert made with cinnamon and chocolate, is a specialty of northern Lazio. In Sicily, cassata and cannoli are traditional desserts; and in Sardinia, casadina (made with a thin puff pastry and stuffed with ricotta and raisins) is usually served. 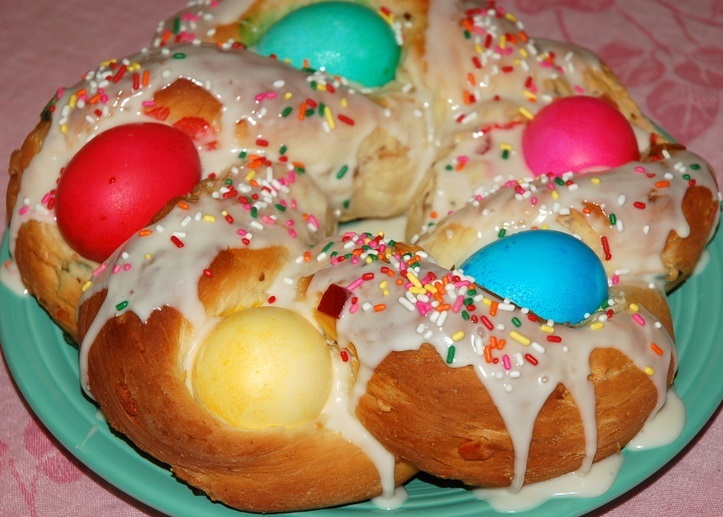 Pane di Pasqua (Easter Bread) is a famous Easter treat made all over Italy. If you are on a gluten-free diet, you do not have to miss out on these traditional Easter treats. If your favorite dessert calls for a large amount of flour in the recipe, purchasing a gluten-free all-purpose flour mixture will be the key to preparing these treats. These mixes are often made up of a mixture of gluten-free binding and rising agents like xanthum gum, baking powder, baking soda and a variety of gluten-free flours, such as: brown rice flour, garbanzo bean flour, tapioca flour, potato flour, buckwheat flour, coconut flour, almond flour, teff flour and sorghum flour. I am sharing recipes below for traditional Easter treats and their gluten-free counterparts. 1 ½ tablespoons orange liqueur, such as Triple Sec or Grand Marnier. One day ahead prepare the wheat or rice for the filling: Rinse hulled wheat or rice with water and place in a large bowl. Add enough cold water to cover and let soak overnight in the refrigerator. The next day, drain the wheat and place in a saucepan with enough milk to cover. Cook over medium heat, stirring occasionally, for about 20 to 30 minutes, until tender. Cool completely for use in the recipe. Prepare the pastry dough: Mix the ingredients together in a processor by hand, wrap the dough in plastic wrap and let it chill in the refrigerator for a half hour before using. Prepare the filling: In a saucepan place the milk, the cooked grain, the butter, and the lemon zest. Simmer together on low heat for about 10 minutes, mixing often, until all of the ingredients have formed a creamy mixture. Turn off the heat and let the mixture cool. 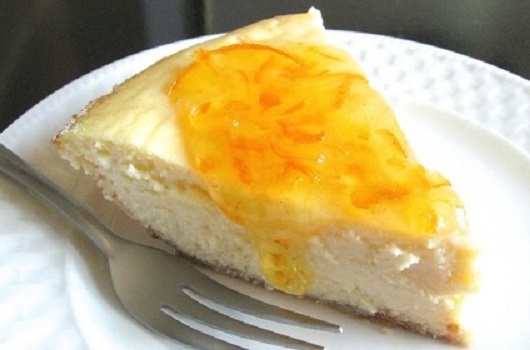 In a food processor combine the ricotta, the sugar, the eggs, the vanilla, the cinnamon and the orange liqueur. Pour the ricotta into the wheat or rice mixture and mix together. Cut the dough into 2 pieces, making 1 piece twice as large than the other. Using a lightly floured rolling-pin, roll out the larger dough piece to fit into and cover the sides of a 10-inch springform pan (a springform pan makes it easier to remove the pie) or 2-inch deep pie dish. Roll the pastry dough out as thin as possible — less than 1/8th of an inch thick is about right. Butter and flour the baking dish. Pour the filling for the pie into the baking pan. Roll the other piece of dough very thin. Cut this into strips and place across the top of the pie, in a criss-cross pattern. Press the dough edges together with a fork. Beat one egg with one tablespoon of water and brush the top of the pie. Bake the pie for about an hour at 380 degrees F. The top of the pie should be golden and the pastry strips very shiny. Once it’s baked, let the pie to cool. Refrigerate overnight. Use the same filling but use rice instead of wheat berries. Flour the pan with gluten-free flour. Make and use the following pastry instead of the one in the traditional recipe. Whisk together the flour or flour blend, sugar, xanthan gum and salt. Cut the cold butter or shortening into pats, then work the pats into the flour mixture until crumbly. Whisk the eggs and lemon juice together until very foamy. Mix into the dry ingredients. Stir until the mixture holds together, adding 1 to 3 additional tablespoons cold water if necessary. Shape into a ball and chill for an hour or up to overnight. Allow the dough to rest at room temperature for 10 to 15 minutes before rolling.Divide the dough as described in the original recipe. Roll out on a piece of plastic wrap or parchment paper that’s been heavily sprinkled with gluten-free flour or flour blend. Follow the directions for filling and baking in the original recipe. Homemade Brown Rice Blend Whisk together 6 cups (32 ounces) brown rice flour; 2 cups (10 3/4 ounces) potato starch; and 1 cup (4 ounces) tapioca flour or tapioca starch. Store airtight at room temperature. Note: You can substitute white rice flour for the brown rice flour if you like; it’ll make your baked goods grittier (unless you manage to find a finely ground version). Directions Preheat the oven to 350°F. Butter the inside of a 9″ pie pan at least 1 1/2″ deep or use a deep-dish pan, if you have one. If your pie pan isn’t at least 1 1/2″ deep, substitute a 9″ square pan. To make the crust: Whisk the dry ingredients together. Then add butter and water. Knead dough until well combined. Then press the dough into the pie plate, working the mixture up the sides. Place the pan on a baking sheet, to make it easy to handle once you’ve added the filling. To make the filling: Mix together all the filling ingredients in an electric mixer and beat slowly until well combined. Pour the filling into the crust; it will come nearly to the lip of the pan. Bake the pie for 45 to 50 minutes, until lightly brown around the very outside edge, and an instant-read thermometer inserted into the center registers 160°F. The pie will still look quite unset in the center. Remove the pie from the oven and cool it to room temperature. Once it’s cool, refrigerate until chilled. Serve pie plain or with the topping of your choice. In a small saucepan, heat the milk and butter together just until the butter melts, set aside to cool. Add 1 tablespoon of the sugar to the warm water and stir to mix, then sprinkle the yeast over top of the warm sugar and water and set aside for about 5 minutes. In the bowl of a standing mixer with a whisk attachment, mix together the eggs and sugar until combined, add the butter and milk mixture, the yeast and water mixture, the vanilla and orange zest and mix until all the wet ingredients are well combined. Switch the attachment to a dough hook and add 4 1/2 cups of the flour and the salt, mix until a soft dough forms. Gradually add a little more flour, if needed (1/4 to 1/2 cup ) to make a smooth but slightly sticky dough. Turn onto a lightly floured surface and knead for a few minutes or until the dough is very smooth. Shape dough into a ball. Lightly grease a large bowl with some vegetable oil, place the ball of dough in the oiled bowl and brush a tiny bit of oil over the top as well. Cover with plastic wrap and place in a warm spot to rise for about 1-1/2 hours or until it has doubled in volume. Line two baking sheets with parchment paper and brush them lightly with some melted butter, set aside. Once the dough has risen turn it onto a lightly floured surface, punch it down and cut into 4 equal pieces. Roll each piece into a rope about 22 inches long. Lay 2 ropes at a time side by side in front of you and loosely braid them together. Lift the braid onto one of the prepared baking sheets and pinch the ends to seal so now you have a circle. Place 3 colored eggs in each circle lengthwise, tucking them between the ropes. Do exactly the same process with the other 2 ropes. Cover with plastic wrap and place them somewhere warm for 45 minutes or until doubled in size. Brush the tops of the bread with the egg wash. Bake them for 30 minutes or until golden, making sure to rotate the baking sheets halfway through for even baking. Let them cool completely. Decorate with frosting and sprinkles, if desired and serve. To make the dough: Combine all the dry ingredients in a mixer bowl. Add the soft butter, blending on low-speed until coarse crumbs form. Add the oil, milk, egg and vanilla, beating until incorporated. Scrape down the sides of the bowl. Beat on medium speed for 2 to 3 minutes or until the dough comes together; scrape the bowl down again. Switch to the dough hook and knead a few minutes until the dough is smooth. form the dough into a ball and place it in a greased bowl. Cover the dough and let it rise for about 1 to 1 1/2 hours, or until visibly puffy. Line 2 large baking sheets with parchment paper and set aside. Once the dough has risen, preheat oven to 375°F. Divide dough into 4 equal pieces. Knead one piece on a surface floured with gluten-free flour; divide the dough into 3 equal pieces; roll into 12-inch long ropes and pinch the top portion together; braid; pinch the ends together; form into a circle. With a wide spatula, transfer the formed dough to one side of the baking sheet; repeat with the second piece of dough and place on the other side of the baking sheet. Repeat with the remaining dough to form two more braids and place them on the second baking sheet. Brush the tops of the braided bread egg wash; place a colored egg in the center; bake for about 20 – 25 minutes or until golden brown. Reverse the pans halfway through baking. Transfer the baked bread to a cooling rack to cool completely. Decorate with frosting and sprinkles, if desired and serve. Directions Beat butter and sugar in an electric mixer until well blended. Add eggs, baking powder and extract then slowly add flour. Preheat oven to 350 degrees F Roll one rounded tablespoon of dough into a ball and place on parchment covered cookie sheets. Cookies do not spread so you can place them close together. Bake for approx 8-10 minutes. Remove when the cookies are still light in color but do not bounce back when touched. These cookies can dry out if you bake them too long. Cool on a rack. For the Frosting Mix until the sugar-coating is of medium consistency, dip the top of the cookie in the icing, let the icing flow down along the sides of the cookies. Preheat the oven to 375 degrees F. Line 2 cookie sheets with parchment paper. Set aside. Combine the flour, sugar, baking powder and xanthan gum. Cut in the shortening until mixture resembles coarse crumbs. Mix in eggs and vanilla. Pull off walnut-size pieces and roll into a ball. Place on prepared cookie sheets. Bake 10-12 minutes. Use the frosting ingredients and directions from the traditional recipe. Yum!! All of the recipes are so inspiring!! I’ll have to make a schedule for making them — not all in one year unfortunately. It is wonderful that there are alternatives for those who can’t tolerate wheat. We’re lucky we can eat practically anything!! Your recipes look delicious. Grazie Jovina e buona giornata. Definitely not all in one year. Thanks so much for your comment, Marisa. Great post Jovina! Thanks for sharing gluten free options for some traditional holiday favorites! This pie looks amazing. I love the ricotta in it. I also love the ricotta pie! You really are a wonder. Thanks Amanda. I have always used ricotta in most our desserts and my children prefer that even in regular cheesecake. Liza, if your mix has xantham gum, then you do not need to add it to the bread recipe. Thank you for visiting my blof. Tried the Easter Bread recipe.The dough rose very well, however, it was so sticky that I couldn’t knead or work with it. Followed recipe to the letter, disappointing. Sorry, you had that experience. Don’t know why it was too sticky to work with. Did you try adding more flour? Yes, I did add more flour, didn’t seem to help. Yes, I did add more flour, did not seem to help. I sent you an email with photos on how I make these gluten-free braids.